Photography is more than simply freezing a moment in time. It’s about examining the world around us, figuring out how we fit into it, and making our own mark. That’s precisely what photographer/artist Wayne Martin Belger aims to do with his rather unusual pinhole cameras. He doesn’t simply make an observation on film; he interacts with the world in an entirely unique way. In Southeast Asian culture, Yama is the god of death. It’s said that he was the first human to die, and that he then became the steward and the judge of the dead, seeing the very essence of every soul. It is fitting, then, that this camera made by Belger “sees” in 3D, with a thin membrane creating two separate cameras. The Yama camera uses a 500-year-old Tibetan skull adorned with various gems and precious metals to observe the modern world. The artist intends the camera to be used for two photo series: one about modern incarnations of Asian deities and one exploring the refugee cities of India. 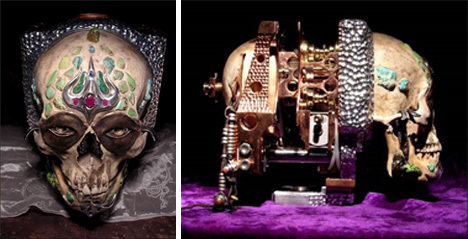 The Third Eye camera is made from a 150-year-old skull that used to belong to a 13-year-old girl. The artist created a third eye in the skull, and this is where light enters the chamber to make photographs. The photos themselves (one of which can be seen at the very top, in the center) are stark, foggy, and discolored, almost as if they are the actual memories of the skull’s former occupant. Some people are horrified at Belger’s work, some intrigued. But it’s safe to say that there are no other cameras exactly like these anywhere in the world.